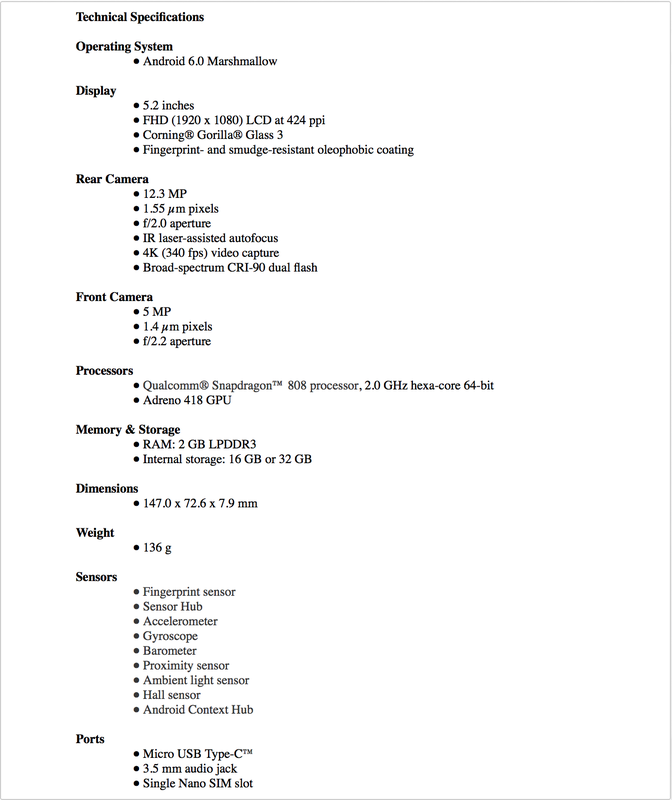 Here's the full spec sheet. We're confident this leak is legitimate not only because it lines up with the specs and features we've been hearing about, but the camera promo pic shows the updated Google Camera 3.0 UI, which we got a look at recently. The rest of the doc is on Imgur, but all the important parts are here. The choice to go with 2GB of RAM will be devastating to some people. The standard for a flagship phone, even one with a Snapdragon 808, is 3GB these days. 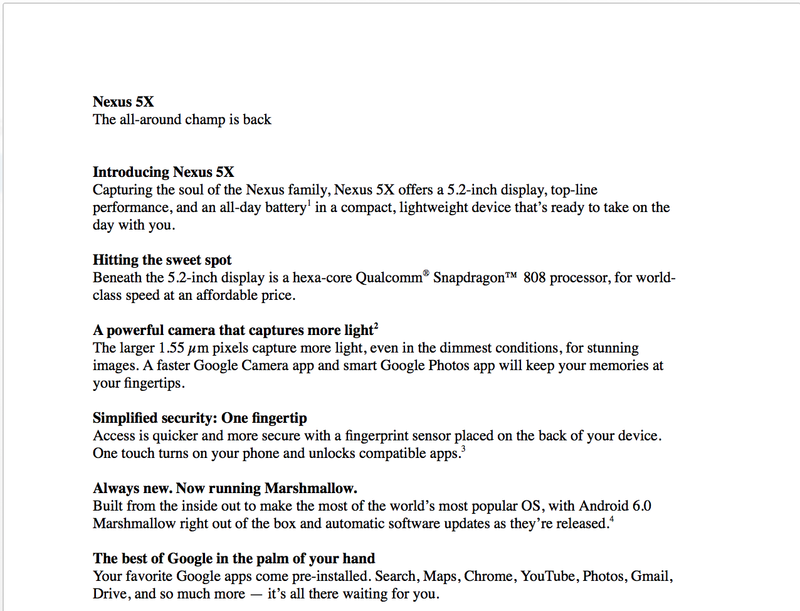 With only 2GB of RAM, the Nexus 5X is matched with the Nexus 5 from 2013. It might be totally fine on Marshmallow with 2GB—it's hard to say if this will really matter. Still, that number is smaller than the number people were expecting. The rest of the spec sheet is in-line with expectations. There's a Snapdragon 808, 5.2-inch 1080p screen, and a 12.3MP camera. The fingerprint sensor will turn on and unlock the device, according to the document. 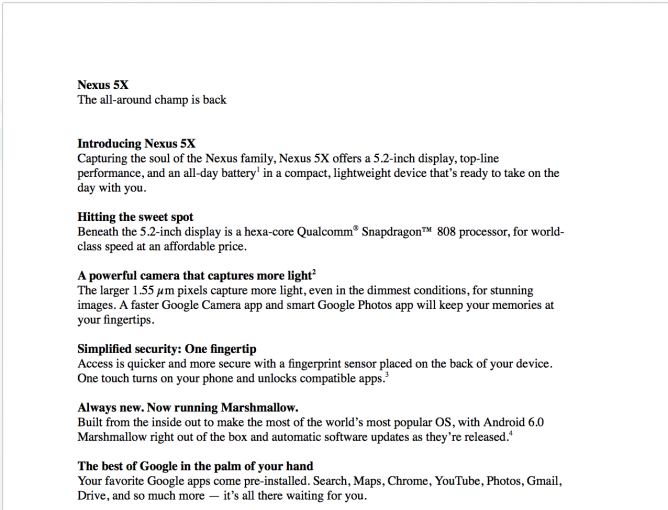 We'll find out tomorrow if the Nexus 5X is indeed "the champ," but it's clear Google is positioning the 6P as the true flagship Nexus.